Well, I am down to my last two walks for the Geelong, Bellarine & Brisbane Ranges book, which brought me back to Point Addis along the Surf Coast. I couldn’t believe how quiet it is out here – even in the middle of school holidays we only passed one or two walkers along the Ironbark and Jarosite tracks. The views really are stunning, with the rich reds of the jarosite in the soil absolutely glowing in the afternoon sun,despite the cloud cover. Tracks are reasonably well sign posted, though the map on the information board at the car park was woefully inadequate and there don’t seem to be any Parks Victoria parknotes or maps to download online either. Hopefully the two walks I will include in the book will help close that gap. 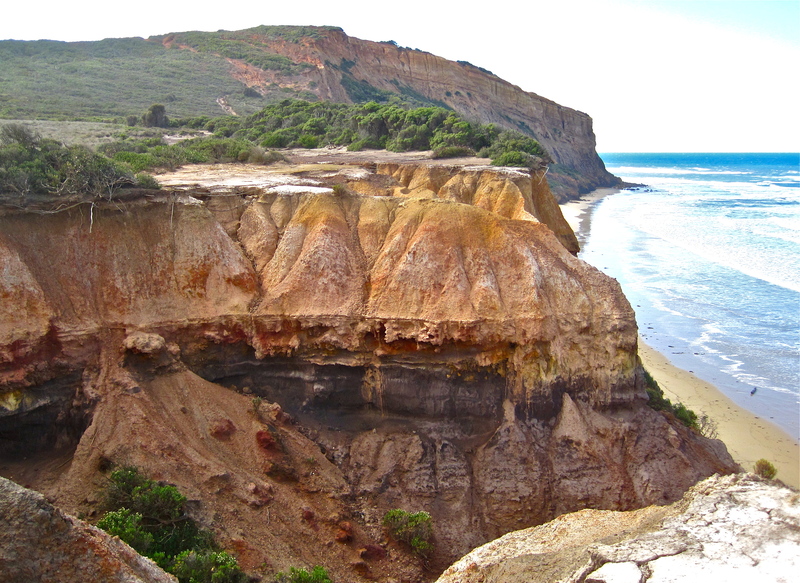 While walking here, it is important to stay away from the high cliff edges, as the soft sandstone and jarosite is rapidly and unpredictably eroding and crumbling away. We took our two dogs along (both on leads) and it is critical that dogs (and walkers) keep on made tracks and are diligent about using the cinnamon fungus boot wash stations on entering and leaving the park to help prevent the spread of this devastating disease which is destroying large tracts of our beautiful grass trees. 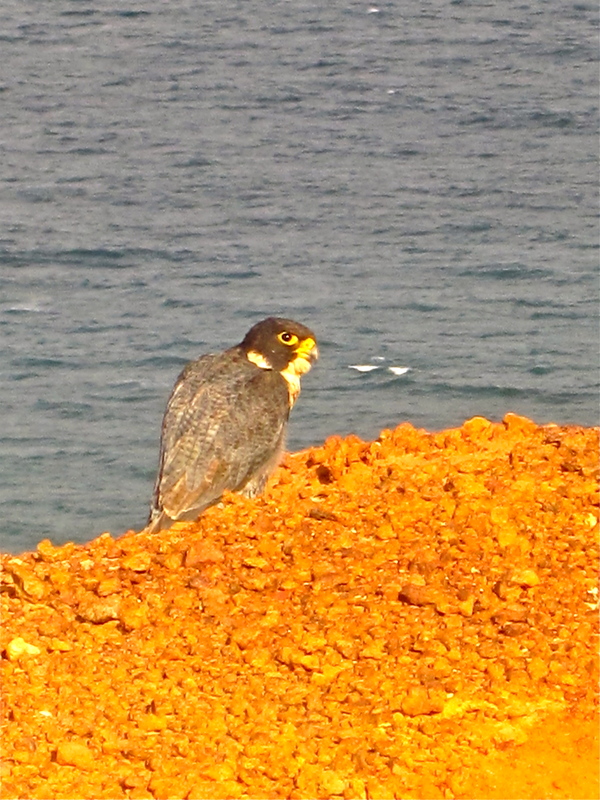 A big unexpected bonus at the end of the walk was this fearless Peregrine Falcon, sitting right on the edge of the clifftop, surveying his territory. I am heading off to Point Danger at the end of the week to complete the walks, then it will be head down and walking boots hung up for a while, to get the walks all written up for the publishers, hopefully with a view to the book being published by August. I have posted the list of planned walks for the new book on its dedicated page. Thanks Greg – Yes, they could do with walking and sorting out the signs: they start well then peter off – I got some handy tips from some locals at the start of the track and in the end just followed my nose. I also knew I was on track when I saw the delightful ‘Tiger Snake Breeding ground’ sign which you had featured in your blog! Now I wonder if that is in reality just a more inventive Parks Victoria track closure sign??!!! Wow! Never seen a falcon that close up before… Lucky you! Me either, Neil – and it didn’t seem bothered by me at all – I was just 10 feet away, with just a little point and shoot! 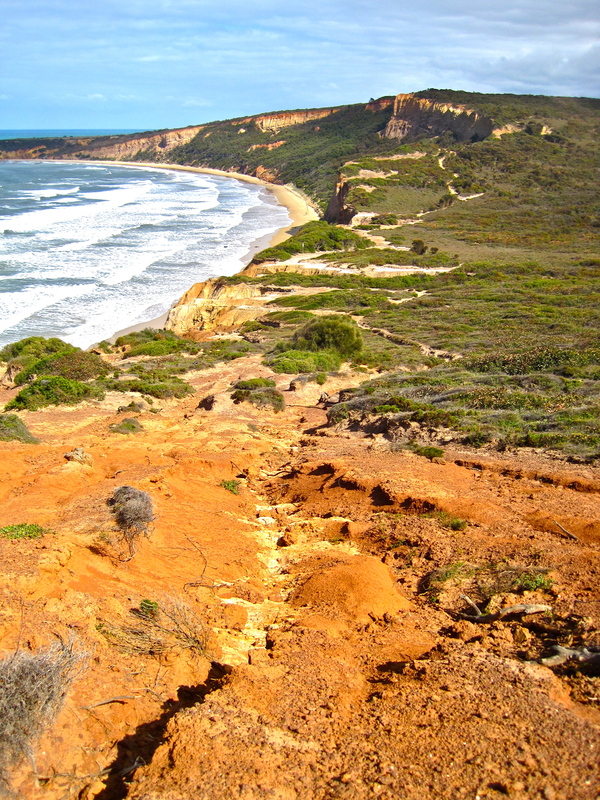 Did Walk 31 in the book today (Ironbark Basin & Jarosite Headland). There is now a fence at the Tiger Snake Breeding Ground sign and it is now a re-vegetation area. Walkers cannot proceed past point 4 on the map in the book. The track between point 4 and 6 is now closed (looks permanent). Instead of turning left at point 4 (now not an option), if you turn right, the track links up with the Koorie Cutltural Walk (Walk 30 in the book). Hi again Peter – that’s very useful (But a real bummer) – I will ring Parks Victoria to find out what is happening there. What a shame, as it’s such a gorgeous walk, though I understand why,a s the erosion was quite considerable. However, there are also other possible routings. Thanks again.